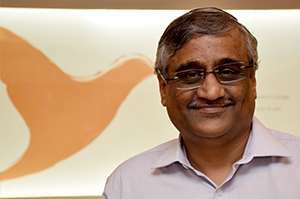 Kishore Biyani is the Founder and Group Chief Executive Officer of Future Group, one of Inida’s leading consumer goods organizations focussed on the food, fashion and homeware segments. The organization believes modern retail plays a vital role in the growth of the economy by creating demand for value added goods and thus supporting the growth of domestic manufacturing, jobs and income generation. The group’s emblem, the Sone Ki Chidiya, symbolises its vision of playing a role in bringing back the epithet of the ‘land of the golden bird’ back to India. In 2001, Kishore led the creation of Big Bazaar, a 280-store large format retail network that is counted among the most trusted brands in the country. The group’s businesses also include multiple retail chains like HyperCity, EasyDay, Nilgiris, Heritage Fresh, Foodworld, Central, Brand Factory, FBB and Home Town. These chains are present in over 355 cities and towns in almost every state of the country. The group also operates a pan-India logistics network, a fast growing portfolio of brands in fashion, footwear, food and personal care and manufacturing, agri-sourcing and processing facilities located across India. Every year, almost 500 million customer visits are recorded at the group’s stores. Kishore has also led Future Group in investing and mentoring a number of supply partners and entrepreneurs as well as joint ventures with British footwear marker, Clarks, Italy’s leading insurer, Generali Group, Swiss consumer goods major, Mibelle AG, America’s Hain Celestial, New Zealand’s dairy group, Fonterra and Middle East’s Ramdas Khimji. Kishore is a firm believer in the maxim of ‘Rewrite Rules, Retain Values.’ He was born in Mumbai in 1961. In 2007, he authored the book, ‘It Happened in India.’ Kishore and his wife, Sangita have two daughters, Ashni and Avni.